Attending the weekly workshops and teaching their cuisines in the evenings helps to bring chefs out of social isolation. They get to improve their English through regular conversations with English speakers. They build their confidence and self-esteem as they are trained in public speaking and get used to sharing their stories in front of an audience. Many of them talk about the benefits of being given a platform to speak, and be listened to. They develop key employability skills such as time keeping and organisation as well as being trained in culinary skills and food hygiene legislation. We promote integration both through enabling our beneficiaries to participate more fully in society but also by fostering a more welcoming environment among the resident population. 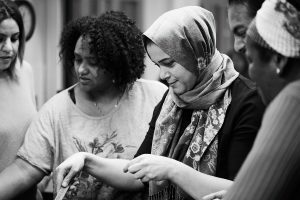 Every one of Migrateful’s cookery classes provides opportunities for positive, personal interactions between migrants and the host population which help to build understanding and challenge preconceptions. In order to promote the social inclusion of migrants, work is needed on many fronts. Language barriers need to be addressed, so they are better able to participate in wider society and access available services. Building the skills and self-confidence to enable them to access employment is essential to improve their economic conditions. Migrateful provides English language teaching, training, a support network and work experience to help address these issues. But the wider environment is not always welcoming. For social inclusion to become a reality, there is also work to be done to shift public perceptions. Migrateful’s classes are designed to create the right kind of environment where misconceptions can be challenged. People from different backgrounds come together, ostensibly to learn to cook from a refugee or asylum seeker. But in so doing, stereotypes are challenged: the refugee is leading the class, and the intimate setting enables personal stories to emerge. Decades of research into the effects of intergroup contact have shown that interpersonal contact is one of the most effective ways to reduce prejudice and stereotyping, provided it is done under the right conditions, which Migrateful’s classes are designed to provide. On one level, Migrateful is a training project, and some chefs have indeed “graduated” on to employment elsewhere. But the journey will be different for different chefs, depending on their previous experiences and trauma, and legal status. For many, in particular the most vulnerable, it is unrealistic to expect them to graduate into full-time employment. While employment is an important yardstick, we would not wish it to be our only one. Migrateful is seeking a number of inter-related outcomes for its chefs, relating to wellbeing, employability and integration. Wider social networks: Migrateful’s weekly sessions provide a support network, which is much appreciated by many, particularly by those who have come to the UK alone.